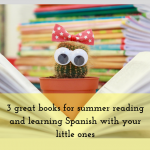 Read our last blog post and find out about 3 great books to read and learn Spanish with your little one. For information about our classes and other events! Summer is close, do you want to learn Spanish?